In its quest to offer best quality hydraulic presses, Santec has incorporated newest technological advancements into its range of vacuum compression moulding presses for rubber, plastic and composites. The results are higher operating efficiencies, higher productivity and better product quality. 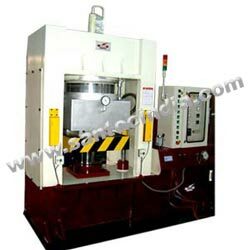 The company offers one of the most advanced compression molding presses introduced to the rubber and plastic industry. Vacuum press with vacuum chamber encapsulates only the mould. Vacuum press with steel doors encapsulates the entire press opening or daylight area. Fully Automatic Hydraulic Vacuum Compression Molding Press for oil seals with three & four parts mould opening with tilting arrangement.